Geniuses go to Summer Camp! Home > Blog > Geniuses go to Summer Camp! This Blog has featured many a famous celebrity who was once a summer camper like yourself. We’ve talked about famous actors, musicians, athletes, entrepreneurs, and all other walks of fame. Today, spotlights someone who isn’t really any of those things, yet he’s still a household name the world over—Noam Chomsky. Considered to be the most important intellectual alive, is it any surprise that he attended summer camp? That’s right, he went to Camp Massad, a Jewish summer camp in the Pennsylvanian Poconos. In operation for 40 years, Camp Massad closed its doors in 1981. It was around his time at camp that Noam’s superior intelligence started to show. Noam attended Oak Lane Country Day School when he was younger. This progressive school allowed its students to study their own interests in an environment that ignored competition. When Noam was only 10 years old, he wrote his first article which concentrated on the spread of fascism after the first World War. Just two years later, he moved on to high school. He was only 16 when he started his college education at the University of Pennsylvania. There, he studied philosophy, logic, and languages—primarily Arabic. It wasn’t difficult for him to land a teaching career at Massachusetts Institute of Technology. Throughout the years, he’s written over 100 books that focus on language, war, politics, and mass media. While his writings got his name out there, it didn’t bring him to the level of popularity that he now has. Noam attributes his success to “a series of accidents”. His name became famous for his anti-Vietnam War activism which made President Nixon put Noam down on his list of enemies. 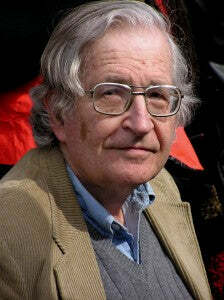 While his anti-war position brought him some trouble and did damage to his career, Noam is still considered the world’s most important living intellectual. A voracious reader, he reads through five newspapers on a daily basis with subscriptions to publications like The Boston Globe and The New York Times. Noam was eager to learn about everything he could get his hands on. A great quote of his is, “I was never aware of any other option but to question everything.” Fighting indoctrination and encouraging independent thought, Noam and summer camp get along great. How will you get along at camp? Learn more about Noam right here and, as always, thanks for reading.